A hundred years from now, anyone who stumbles across the fourth full-length album from singer/songwriter Matt Wertz, “Under Summer Sun,” may feel as if they knew Matt personally. Wertz injects a lot of himself into these 12 soulful, carefree acoustic-rock tracks, revealing generous glimpses of his journey as he works through issues of love, loss and life. All timeless topics that endure the ages. 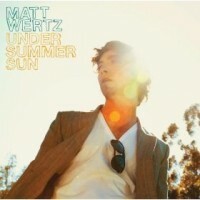 “Under Summer Sun” is a combination of Wertz’s favorite songs from previous independent releases as well as four new songs. Among the new songs are “Waiting,” an introspective look at growing old but not quite growing up. We’ve all been there at one time or another. “Summer Sun” is described by Wertz as a nostalgic summer song with the music of Stevie Wonder and the passion of Don Henley. Close your eyes and watch for summers past to float back into view. The album’s first single, “5:19,” has old-school, jazz-tinged beats, a quietly simmering organ beneath Wertz’s melodious vocals, and lyrics that will rip your heart out. “Back In June” is a look back on a wonderful relationship that didn’t work out. Wertz’s faith is evident on “I Will Not Take My Love Away,” a traditional-styled folk ballad that expresses God’s faithfulness. The mid-tempo rock song “Keep Faith” begins laid back, quickly adding hand claps to reaffirm Wertz’s musical influences. “With You, Tonight” is a fittingly uplifting rocker. On “Carolina,” Wertz continues to amuse with playful, folksy country sounds. One can’t help but wonder if he is singing about a girl he once knew, but it doesn’t really matter because you’re too busy bobbing your head to really care about such lofty meanings. Wertz continues to amass a strong following among the twenty-something college and coffeehouse circuit, which makes him an ideal artist to partner with African Leadership’s Mocha Club to raise support for HIV/AIDS relief. In his freshman year of college, Wertz began to write music and discovered that music was the direction he wanted to travel. At the time, he was quoted as saying, “When I began writing songs, I never intended for anyone to hear them.” Maybe he knew then what we know now. “Under Summer Sun” is not just about music, it’s about life. Regardless of the date on a calendar.